Researchers at Winship Cancer Institute have received $1.2 million to study how the environment can play a role in the development of cancer. Scientists hope to learn how environmental toxins can change the structure of DNA, setting the stage for cell death, cell mutation, and perhaps cancer. Emory will receive a five-year grant totaling twenty million dollars from the National Institute of Environmental Health Sciences to study the relationship between exposures to environmental agents and Parkinsons disease, a progressive disorder of the central nervous system affecting more than one million Americans. The Donna and Marvin Schwartz Center opened with a dedication ceremony February 1, followed by a series of performances and events that will continue throughout the spring semester. 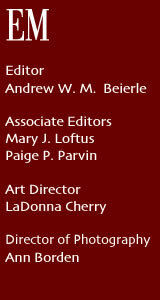 To receive a complete brochure of the arts season, call 404.727.5050, or visit www.boxoffice@emory.edu, or www.emory.edu/arts. Once a standard student computer lab filled with rows of gray monitors and well-worn keyboards, a recently renovated computing center in Emorys Cox Hall lends new meaning to the term cyber cafe. The space, unchanged since 1991, has been expanded and completely redesigned by Emorys Information Technology Division (ITD) to set a new standard for student tech labs. Sleek and contemporary, with soft carpet, low lighting, and ultra-modern furnishings, the center is a far cry from flourescent lights and scarred desks. With its geometric patterns, retro-style angles and curves, and rich designer colors, the space could double as a chic martini bara concept that would undoubtedly make the tech staff nervous. The spacious new lab was designed for flexibility, creativity, and collaboration. For instance, the partition-like walls are moveable, and many double as dry-erase boards. The chairs roll, and in some places computer monitors are positioned close together to allow groups of students to gather and work on projects. A lobby will be used to showcase new, cutting-edge technologies for students as soon as they become available. The front area of the center, once a hallway, has been opened up to serve as a lounge, with plush, coffeehouse-style seating and large, bright windows. There, students can work on wireless laptops or just hang out. There also is a cafe space in the back, for general use and catered events. 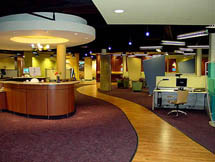 Beneath its stylish trimmings, the heart of the Cox Hall center is its state-of-the-art multimedia equipment. 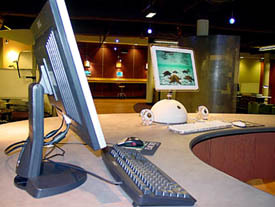 The showpieces are several high-tech wide plasma screens which can display DVDs, be used as computer monitors for presentations, or serve as electronic white boards that can be written on, then printed or sent to the Web. 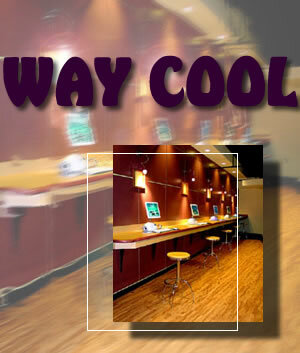 The lab has a Dell PC area with twenty-one machines, a Macintosh area with a dozen powerful G-4s, and an iMac bar for more casual computing needs like checking e-mail. All the computers are the latest available models, with large flat-screen monitors for intense multimedia work. Students have access to scanners, CD burners, and digital movie-making capabilities, and there will be about thirty laptops available for check-out at the service desk. 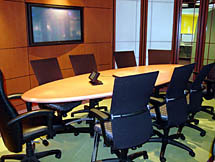 The center also offers a fully equipped conference room and two classrooms with projection screens. All this is backed up by tech support staff, present at all times the center is open. The project cost ITD about $1.5 million, says Harris, who deliberately timed its contruction so that funds were available to purchase all the new equipment at once. The innovative center already has created a buzz among students as well as leaders from other universities, and Harris hopes it will draw prospective students and parents touring the University. There is one reason that we did all this: our students, Harris says. The official response so far has been: Way cool. P.P.P.